Overview: Students had already learned some of the fundamental jewelry techniques like sawing, riveting, and forming, so this project covered some of the non-traditional jewelry class techniques.Nature has always been a source of inspiration for artists, from the cave paintings of Paleolithic era to contemporary artists. It has also been inspirational to all forms of art. The unique part about jewelry that is inspired by nature is that it can be directly made out of that material it is inspired by. In this lesson, students explored different ways of incorporating nature as inspiration. They became familiar with the artwork of Sarah Hood, who directly uses found natural material in her jewelry, David Freda, who is inspired by nature and attempts to capture natural moments in clay and enamel, and Maori tribal jewelry, who uses natural material to demonstrate geometric designs that abstract the natural object. They explored alternative jewelry making by creating a piece that is inspired by nature and incorporated at least two of the three demos of resin casting, bead making, and wire wrapping. 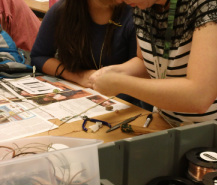 Students demonstrated understanding of how natural inspiration can take different forms in jewelry, and they explored new material and techniques that can be used outside of jewelry class. They also had to consider presentation of their jewelry and how to connect that to nature, so many used stones, branches, or sea shells to display their work. Overview: This project was a perfect introductory to this fundamental 2D art class. 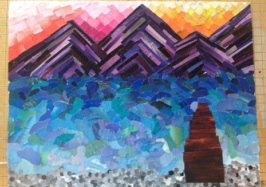 It was not an intimidating project to start with because it did not require drawing skills, although as it went on students began to realize how much effort was required for collage. Students made personal connections first, thinking of a specific memory or dream they had, or thinking of how to show either their past, present, or future. Students could choose whole image collage, ripped image collage, or mixed image collage in order to demonstrate the story they wanted to tell, making it personal and giving students choice. Students demonstrated learning by keeping record of their decision making through in-progress pictures, and then they reflected on the entire experience by creating a digital portfolio on BULB that had in-progress pictures, final image, and a written artist statement reflection. Ally chose ripped image collage to show her past, present and future in a very symbolic piece entitled "Where Fire Meets Sky." Tristan chose a ripped image collage to show a specific life-changing moment that just happened to him, and showing his present interest in dancing. Melody chose a whole image collage to show her hopes and dreams of traveling in the future. Colton chose a mixed whole and ripped image collage to show his past and continued interest in fishing in a particular place. Overview: In this project, students were encouraged to explore and experiment the capabilities of acrylic paint. They were introduced to different acrylic mediums and techniques and encouraged to try new ways to apply paint. This was an introductory project, so it was focused on building confidence and also as a way for students to learn how to express themselves in their art. To make it personal and give them a starting point, students began by choosing two of the color that describe their personality off the "what color are you?" worksheet. They then explored how different techniques could express different personality traits/characteristics. They could choose any size and any surface. This painting ended up representing themselves, but not in a traditional self-portrait way. It became very symbolic of their inner selves. 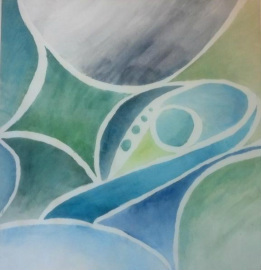 Kaela used masking and glazing techniques to create a calm, soft painting to represent her personality. Megan used a very painterly technique in order to create a peaceful, earthy feeling piece.